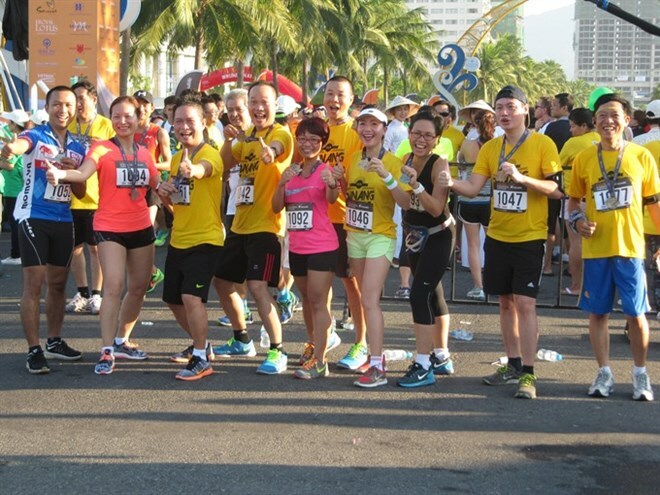 Da Nang (VNA) - More than 5,000 athletes and tourists will race on August 6 in the annual Manulife Da Nang International Marathon, one of the biggest sport events in central Vietnam. The race’s organisers said that this year’s race will offer four categories: full marathon (42km), half marathon (21km), a 10km run and a 5km (Zody Food5K) run. Participants will get a chance to taste cuisine at Zody food court at the East Sea Park on the coast of Da Nang after the race. The marathon will prelude the 2017 Asia-Pacific Economic Co-operation (APEC) summit in Da Nang, which will take place on November 5-11. The race promises to give runners a memorable experience, from allowing them to enjoy the amazing sunrise to seeing the sights and sounds of the city as it wakes up. Marathoners will pass through five different bridges in Da Nang and explore the stunning coastline of the city. As planned, a Sports Day will prelude the race from 9am till 10pm on August 5, offering many interesting participation activities. The event will include a charity portion to help those in need. All the money raised will be given to support handicapped and orphans, Victims of Agent Orange/Dioxin, disabled people, the Village of Hope and 15 low-income families in the city. The Silver Strider Club, which is composed of ‘runners and walkers over 50’, will also join the race to promote a healthy lifestyle and to give a voice to older runners and walkers. “We are proud to bring a Marathon to Da Nang, and we see it as our mission to contribute to a healthier and more active sporting community and to the tourism and sport development of our country,” said Bady Pham, Co-Founder and Managing Director of Pulse Active. “This race, the 5th of its kind, will mark this special occasion and welcome participants from all over the globe,” Pham said. Last year’s race, which drew over 4,000 runners and their families, saw Japanese marathoners Kentaro Masuda and Kyoko Otsuka win the men’s and women’s titles. The race, organised by the city, the World Marathon Company and Pulse Active, is the first Vietnamese marathon certified by the International Amateur Athletics Association (IAAF) and the Association of International Marathons and Distance Races.